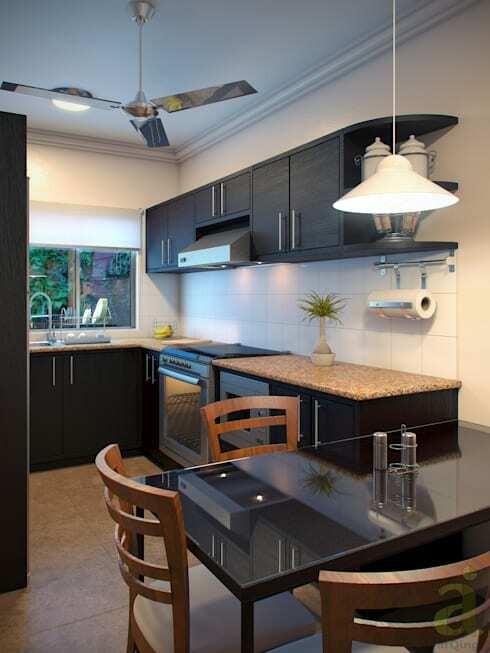 Here, the kitchen island has been turned into a multifunctional space in this small kitchen. This island doubles up as the breakfast bar and has a neat cylindrical chimney coming down over the cook top. Shelves have been built into the side for more storage in this small space. The colours here, too, create a delightful effect! 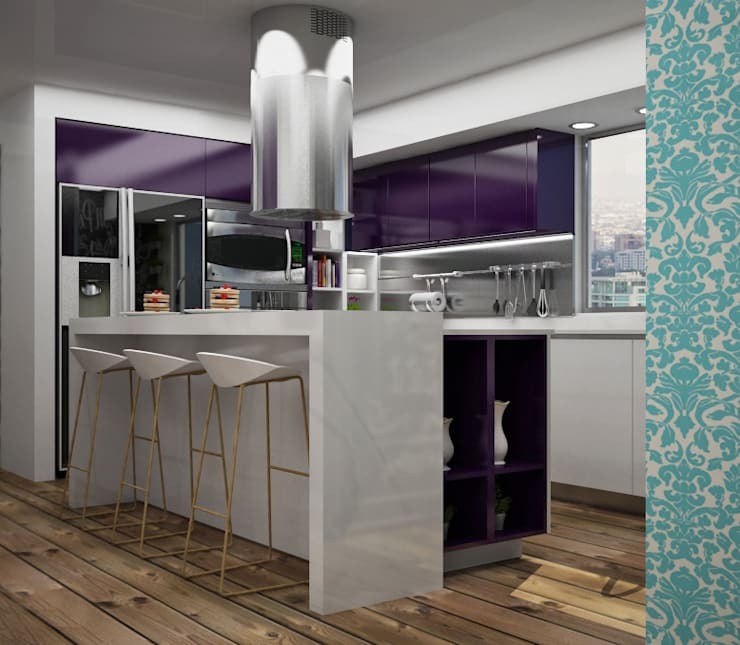 This kitchen by the interior designers and decorators at Amarillo Interiorismo presents a bold colour combination to highlight the neutral setting and demarcate the compact space. 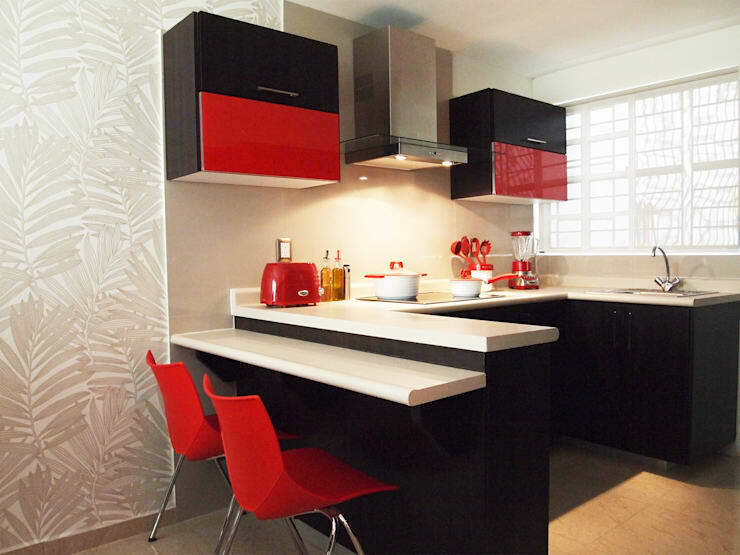 This works well in creating an interesting kitchen marked by the play of symmetry, thanks to the balance of colours like black and red. This symmetry also makes the space look loftier than it really is. 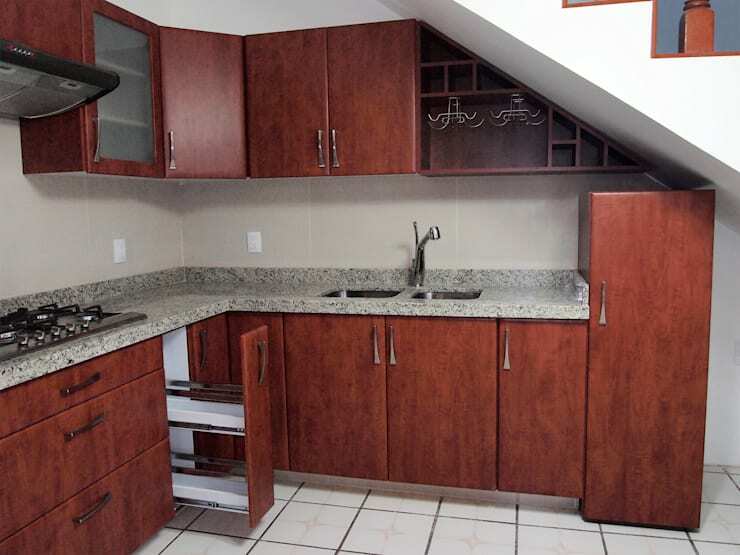 Next up, the various areas have been merged with each other in this narrow kitchen. This has been achieved by placing the chairs around the island, making the rest of the setting a cosy one. 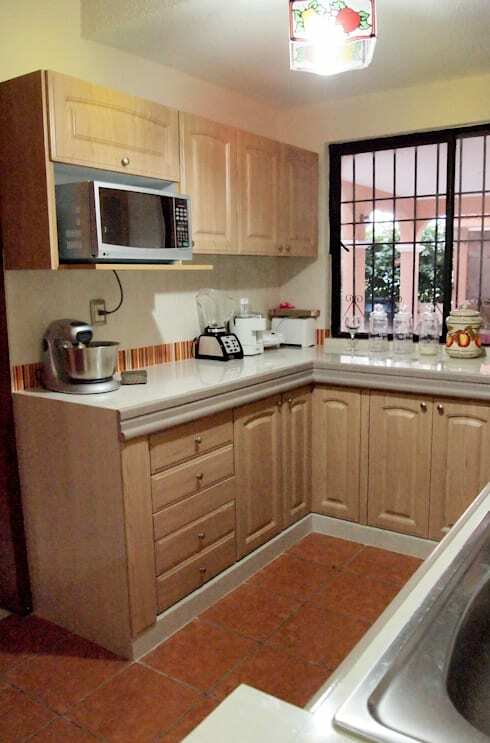 This also segregates the kitchen and gives everyone plenty of space for cooking, as well as dining. The open kitchen here is set in one nook of the home. 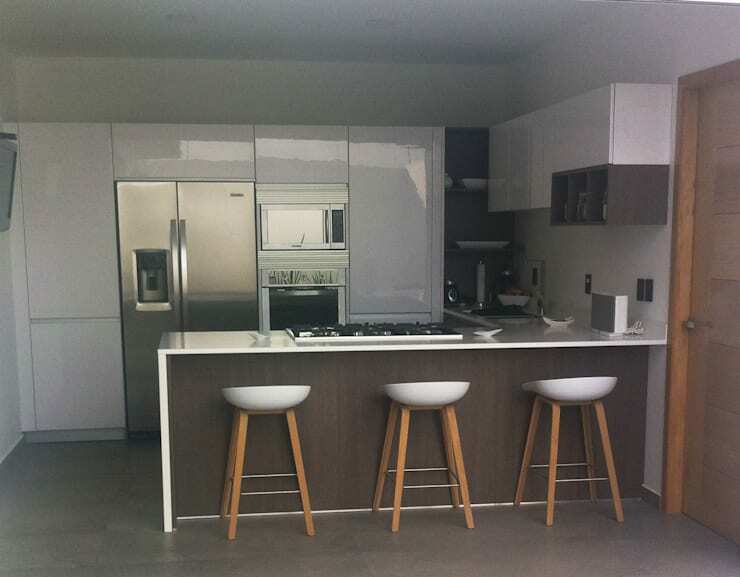 The white and grey colours, with a niche built for the stools under the island, give the room a spacious feel. The wooden elements add a warm tone to this area, while the appliances are accommodated by the white glossy bank of cabinets. The colourful lighting here adds a vibrant touch to this classic L-shaped kitchen. Creamy-hued cabinets bolster the elegance of the space. This kitchen finds a neat fit in an attic-like space, built snugly under the slant of the stairs. The cabinets have been shaped and arranged accordingly, and a robust wooden tone makes a stylish contrast with the white touches of this L-shaped space. Plenty of room was found between the counter and ceiling, which has been used for a line of cabinetry. 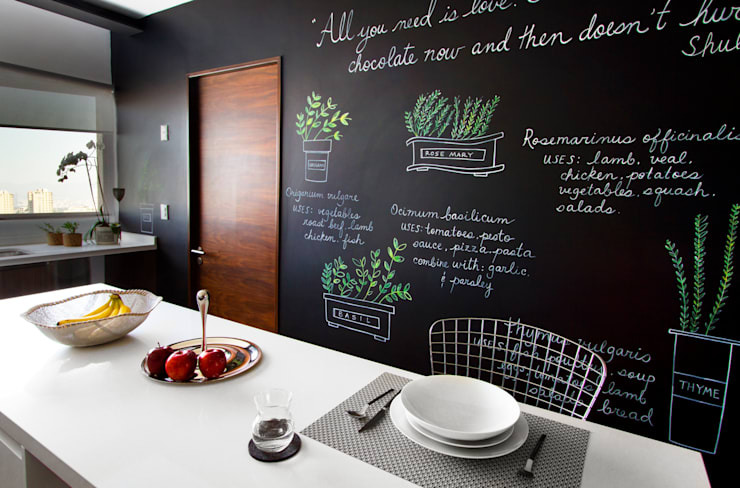 This kitchen is filled with pleasing details, like the chalkboard wall which houses a neat wooden door, and fun drawings on the rest of the wall. A retro garden-style wire chair sits with the white island bringing some eclectic flair, while the rest of the working space is aligned to one side of the kitchen. Hungry for more kitchen inspiration? Take a look at: 8 ingenious kitchen accessories to make your life easier. Which of these kitchens would you choose for your home?